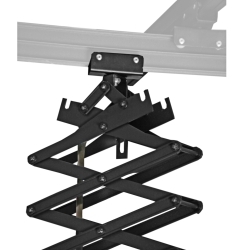 Enhance your walimex Ceiling Rail System on up to 4 Pantographs. The stepless move-out from maximal 200cm helps you to take pictures from even smaller objects. All common studio flashes can be mounted on the 5/8 inch spigot. 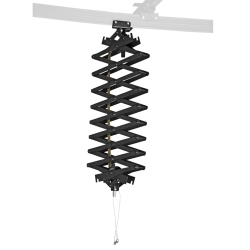 Through the smooth-running carriage rollers, it is easy to move the Pantograph on the guide rail of the Ceiling Rail System without effort. 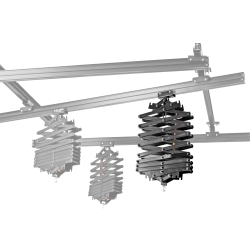 The spring of the Pantograph is made of stainless steel. 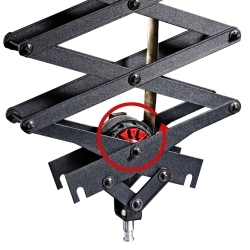 Tip: Should the loading force of the pantograph’s spring decline over time, you can retighten it by turning the friction disk, which is displayed red in the above picture, clockwise. 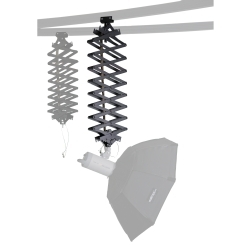 That way, the pantograph can be adjusted to the weight of your flash device at any time.